This post is sponsored by Nathan’s Famous® Beef Franks. All comments and opinions are my own. If you haven’t had the chance to get your discounted Marlins tickets, now is this is the perfect time to grab them! 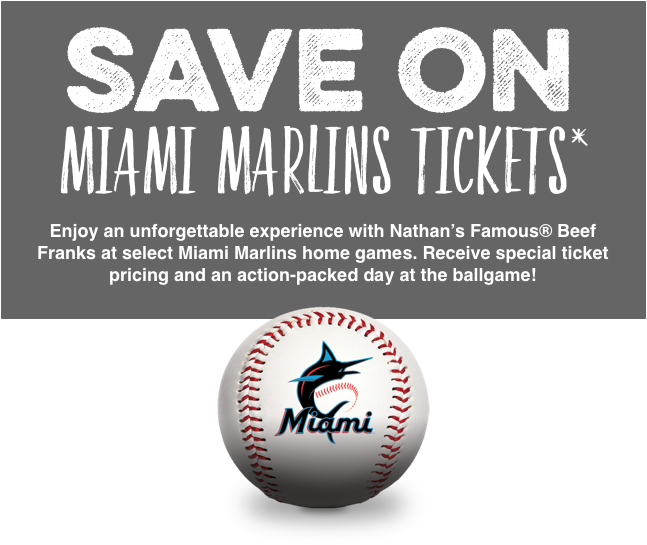 With the current promo you can grab discounted Miami Marlins tickets to select home games when you purchase two (2) packages of Nathan’s Famous® Beef Franks at Publix between 3/29/2019 – 4/21/2019. You’ll be able to purchase game tickets for the reduced price of just $12 (down from the regular price of $23). For a family of four that’s a savings of $44—WOWSA! PLUS…we have a sale right now on Nathan’s Famous Beef Franks as part of the new Advantage Buy flyer. So, you get delicious franks made with 100% beef and no artificial flavors or by-products AND a day of fun at the ballpark at a price that’s easy on your budget. It’s a win/win! Getting your tickets is super simple. Just purchase any 2 of your favorite Nathan’s Famous Beef Franks varieties then head over to the Nathan’s Famous Tickets promo page and upload a copy of your receipt. Once you upload your receipt you’ll get a URL where you can buy discounted tickets for select games. Hard to beat a day of fun for almost half price. It’s a great way to keep your entertainment budget low. Just visit your local Publix and pick up the makings of a delicious meal and then submit your receipt. There are three more home games coming up so don’t miss out! Limit four (4) tickets per transaction during the offer period. Offer available for Marlins home games on 4/12, 4/13, 4/14, 4/19, 4/20 and 4/21. Ticket terms and conditions apply. SMS-mobile device required. Standard text message/data rates apply. To enter without SMS text, visit www.NathansFamousTickets.com and complete the online form. Offer sponsored by Smithfield Foods, Inc., 200 Commerce St., Smithfield, VA 23430. Previous Post: « Benadryl Topical Anti-Itch Cream Just $1.19 At Publix – New Coupons!